Everyone’s favorite red-headed Irish actress – Maureen O’Hara, is due in Cong Co Mayo this weekend to celebrate the 60th anniversary of John Ford’s irrepressible, hugely enjoyable, over the top depiction of the land of his forefathers – The Quiet Man. The 91 year old actress will be staying in the same hotel – Ashford Castle as she did when herself and John Wayne were chasing each other around the fields, throwing pottery at each other and generally creating one of the most enjoyable screen romances in Hollywood history. 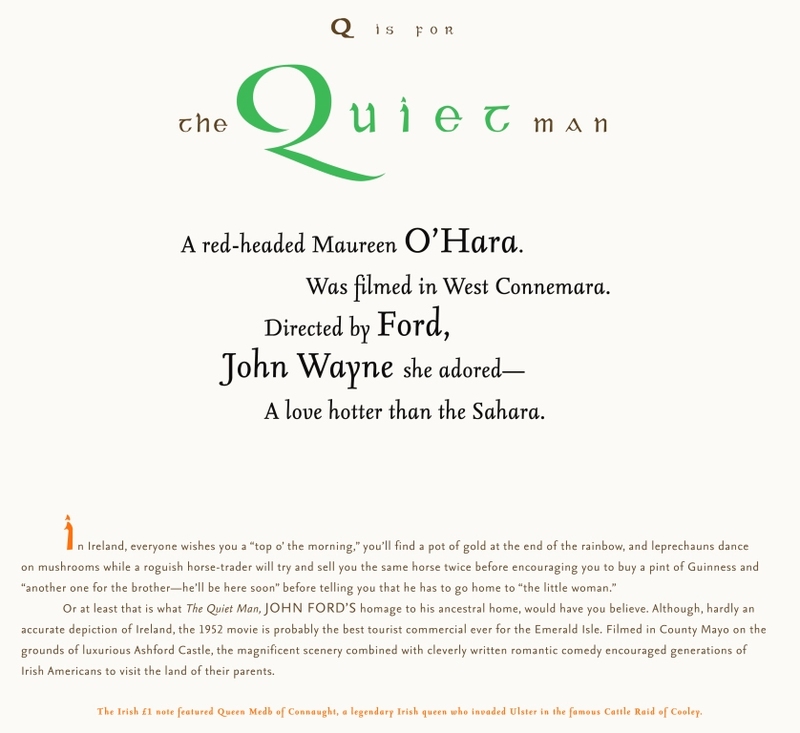 If you are interested in The Quiet Man, John Wayne, Ford and O’Hara, you can read all about it in my new book FOR THE LOVE OF BEING IRISH. Below is just one page / one limerick from this A-Z of Ireland that will have you laughing and learning about Ireland, its people and its history. PRE-ORDER: FOR THE LOVE OF BEING IRISH and I’ll sign your copy. Of course in The Quiet Man, quite a bit of activity took place in the local pub. I know this will come as a shock to you! Written by award winning business speaker and humorist Conor Cunneen, For the Love of Being Irish is a beautifully illustrated book providing an A-Z of Ireland, This is a book that will have you Laughing and Learning through lyrical limericks, powerful prose and Imaginative Illustrations. Here you will see, read and feel all the emotions of a tiny country that has taken the world by storm. You will read humor, horror, history. You will laugh, maybe even shed a tear in a wonderful book that showcases all the emotions of Ireland and you will be raise a glass that you can say (or wish to be) For the Love of Being Irish.